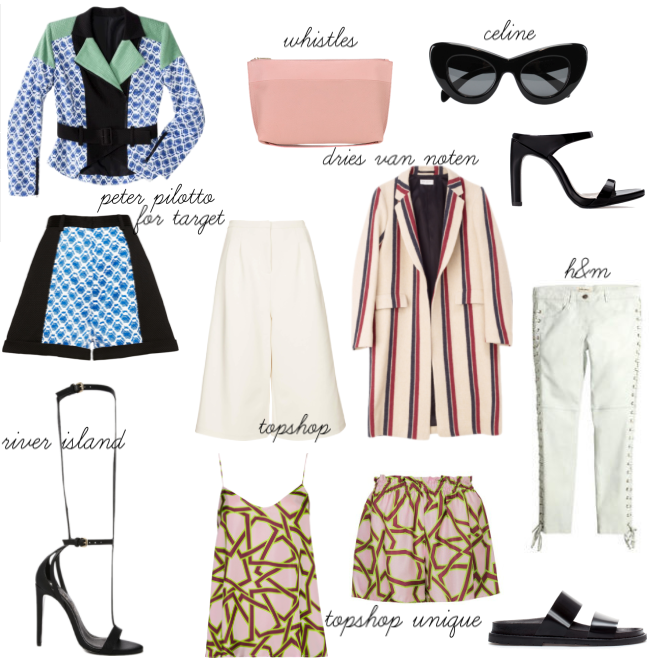 Peter Pilotto for Target Top & Shorts, Whistles Clutch, Celine Sunglasses, Zara Mules, Topshop Culottes, Dries Van Noten Coat, H&M Trousers, River Island Heels, Topshop Unique Cami & Shorts, Zara Sandals. We are well into February now and with pay day feeling like forever ago what better than a wish list to get me through the month! I've just booked my summer holiday so bikinis, sandals and generally anything summer related it on my radar at the moment. I have to admit I was highly amused when I saw that birkinstocks and large chunky man-ish sandals started to trickle in from the catwalk, but I have to say I think I've been won over. Come summer I can pitcher them paired with tailored culottes and an oversized shirt. Everyone knows how much of a shoe girl I am and I couldn't resist picking out these Zara mules and River Island strappy calf length heels. *Heart eyes* Imagine either pair of heels with this matching Topshop Unique printed set or this Peter Pilotto for target number, hello! Lovely choices! The Celine sunglasses are gorgeous and that stripey jacket is awesome!